The government of France has selected bids for 541 MW of solar plants of various technologies through two requests for tenders (RFTs), including five projects submitted by Element Power Solar for a total power of 18 MW. Gill WindObserver70 and WindObserver75 ultrasonic wind sensors are designed to operate in extreme environments, featuring optional high-power anti-icing heating systems, full stainless-steel constructions and a wide range of mounting and connection options. Renovo Power Systems LLC is a new and growing international venture based in Ann Arbor, Michigan. Their cooperation with Power Panel Inc. is providing innovative technology and high value solutions for integrating Solar Thermal and Solar PV for small to medium sized businesses in Michigan and worldwide. Is the Trend For Solar Power M&A Set to Continue? A new report from Bloomberg has revealed that solar power mergers and acquisitions broke records in 2011 – but is the trend set to continue? SAEE wins international award again! The SAEE is currently in its 10th year of existence and in the latter part has taken major strides in placing South Africa on the map in the world when it comes to the dynamic fields of energy engineering, energy efficiency and energy management. The PowerDish installation will help increase TEAD's energy security and attain goals outlined in the Army's Energy Conservation Initiative Program. Backed by the U.S. Army Corps of Engineers. Fuel cells can help resolve many issues facing ports. By deploying this clean and modern technology, ports can reduce pollution and increase operational efficiency. Fuel cells generate electricity using electro-chemical reactions, not combustion, so there are no polluting emissions, only water and heat as by-products. Algae converts at a very high efficiency into biocrude, as it has lots of caloric value and happens to have the same molecular structure as petroleum. So out of all the whole biomass sources, algae is probably the most efficiently converted to biocrude. While the addition of each Plug-in Hybrid Electric Vehicle (PHEV) to the street is a victory for the environment, their widespread adoption will present another potential challenge to the power distribution system, particularly in urban networks. Federal and state R&D credits provide a dollar-for-dollar offset against tax liability up to an average of approximately 15 percent of qualified spending, i.e., taxable wages, supply expenses, and a percentage of contract research expenses related to research that goes into developing new and improved products and processes. Recent developments in communications, computational capability, and data availability all lend themselves to a high level of intelligence both on the battlefield and within the utility. The proposed benefits of the "smart grid" align well with recent developments in data integration, mining, and fusion. 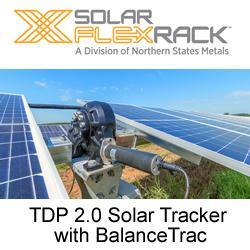 Solar FlexRack's latest solar tracker technology bundles an advanced tracker design with a full team of seasoned engineering and installation experts at your service. The next-generation solar tracker delivers a package of features that both enable increased energy yields for commercial and utility-scale solar installations, and significantly reduce project risks. That translates to smart installation cost-savings across your project budget.